In this article, we’ll discuss the Abstract Factory design pattern. The book Design Patterns: Elements of Reusable Object-Oriented Software states that an Abstract Factory “provides an interface for creating families of related or dependent objects without specifying their concrete classes”. In other words, this model allows us to create objects that follow a general pattern. An example of the Abstract Factory design pattern in the JDK is the newInstance() of javax.xml.parsers.DocumentBuilderFactory class. 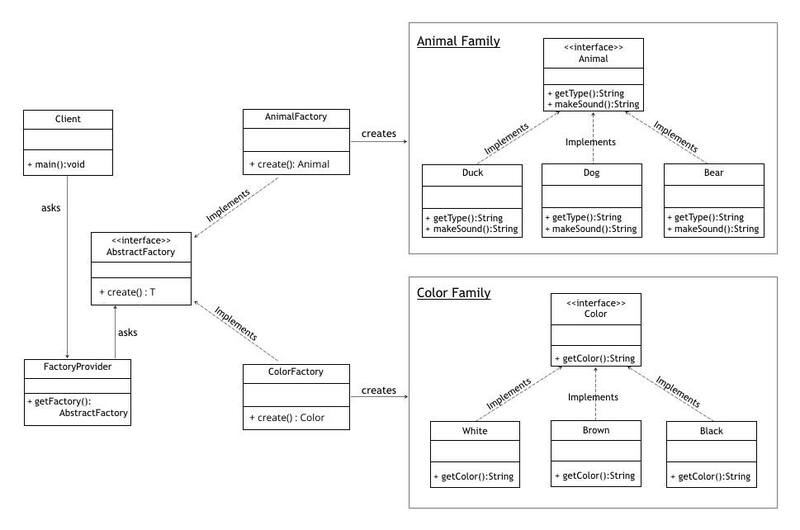 In this example, we’ll create two implementations of the Factory Method Design pattern: AnimalFactory and ColorFactory. First, we’ll create a family of Animal class and will, later on, use it in our Abstract Factory. Furthermore, we can create more concrete implementations of Animal interface (like Dog, Bear, etc.) exactly in this manner. The Abstract Factory deals with families of dependent objects. With that in mind, we’re going to introduce one more family Color as an interface with a few implementations (White, Brown,…). We’ll skip the actual code for now, but it can be found here. Similarly, we can implement a factory for the Color interface using the same design pattern. While the pattern is great when creating predefined objects, adding the new ones might be challenging. To support the new type of objects will require changing the AbstractFactory class and all of its subclasses. In this article, we learned about the Abstract Factory design pattern. Finally, as always, the implementation of these examples can be found over on GitHub. Thanks for the comment. I’ve updated the article. The getFactoryMethod can be a static method, an instance method; it returns an implementation of AnimalFactory (the implementation is a “concrete” factory). An easy and flexible way to implement this method uses a Map. As a consequence, adding a new type of Animal does not require to modify anything, just create the Animal and AnimalFactory implementations, register the factory into the Map. Of course, there are other implementations of the getFactory method, for example Toolkit.getToolkit() which is a singleton. The DocumentBuilderFactoy.newInstance() has another behavior too. Thanks for the comment. I’ve updated the AbstractFactory implementation based on a comment above, and now the sub-classes don’t need to be modified when adding a new type of Animal. The getFactory method in your example is placed in the FactoryProvider class, but it’s using the if statement and not a Map.